I'm often asked by my peers on the West Coast what their is to do in Branson, Missouri. This article really hits home. Forget the shows - the theme parks - the kind people that live here. What it's really about is the beauty and lessons these hills have to share. Ernie Ranie grew up in the theme park many of you remember from your youth. Though more of a ghost town now. The Linn County times wrote an article about the principle's youth and how it helps him as a scholar and educator. Always more intrigued as a boy by what he could find off the beaten path than by what attracted tourists to the developed area of Dogpatch, the now-grown elementary school principal observes, "The whole art of teaching a child involves gaining access to the backroads of his heart and mind, allowing him to be what he is and waiting to help him take that next step when he is ready." All major local publications voiced support for the Branson Tourism Tax over the weekend. Ok, now think about it - a couple hundred years ago a "town crier" would, well - cry the news in the middle of the town square. I know quite a bit about this custom having dated the daughter of one of the top "town criers" in the world. To be precise - #1 in Canada, having cried before the Queen herself! It's not with pride that I say I almost wet myself when I saw the costume. You see, the English redcoat to me conjures pictures of Paul Revere screaming at the top of his lungs , screaming - they're coming to kill us. "The Red Coats are coming , The RED COATS ARE COMING!". I guess the town crier did have a place. If you think about it, truly, the birth of America has everything to do with the birth of new media. Is it at all possible to understate the value of Thomas Paine's tiny pamphlet? Isn't it just Common Sense ? The town crier was made a legend and the newspaper reigned for over a hundred years. I wonder, and am quite certain that there was a "Town Crier Union" which probably lost a great deal of power at the turn of the 19th Century. As certain as video killed the radio star - the Internet will kill the news reporter. Newsflash: The Branson Daily News is creating a new Content Management System. I expect good things and am looking forward to its release! 40 Minnesota Senior Citizens on a bus from Missouri (imagine that) broke down on the way home. Apparently, Lebanon residents demonstrated generosity and warmth to the distraught tourists- . Jumbled reports made it halfway through the wire. Apparently, Lebanon residents shared Branson's tradition of hospitality by providing for these individuals. At this time no details have been issued regarding the extent and personal actions of Lebanon residents. Though the details haven't been distributed through the wire - Reports of Ozark's warmth have proven themselves contagious. Branson has some great things coming through the pipeline. No, I'm not talking about the Landing or several multi-billion dollar development projects announced over the last few weeks. I'm not talking about a Mel Tillis comeback or who's who on the 70 + circuit. We have a new generation coming and the reigns are slowly being handed over. This is something to be excited about. For instance, the Haygoods are growing up and getting national attention- Branson's own will make us proud. Branson launched it's first Rock n' Roll show featuring hits from the 1990's as opposed to 1919. I'm excited today because the next generation is rising up - newbies being pruned for the top leadership spots. I'm excited becuase I see more integrity and an explosion of creative talent rising through the pores of Branson's foundation. I'm excited because a new promise for Branson is being delivered - with new leadership and new stars. But mostly, I'm excited because I get to watch it happen and even participate in the transformation this city will see in the next few years. These words are written on the southern walkway to a gazebo. BVTF Tactical Operations Center (TOC), Veterans Reception & Vendor Village will be located at Celebration City Convention Hall: All American Lunch served Daily from 11;30 am(1130 hrs) to 1p.m (1300hrs) free to veterans and active personnel, courtesy of the Golden Corral and Branson Veterans Task Force. Vendor booths will be open from 9am (0900 hrs) to 6p.m.(1800hrs). The TOC will be open from November 7th through the 11th. Veterans Registry is at the BVTF Tactical Operation center (TOC) and the Grand Country Square from 9 a.m. (0900 hrs) to 6p.m. (1800 hrs). Looking for friends from your unit or hoping someone might be trying to find you? Get your name in the Branson Veterans Task Force Registry. No charge for registration or searches. Veterans Patch Wall, Grande Country Square - FREE - Hundreds of patches collected from all services hold special meaning for each branch, division and unit represented. See this collection in progress. Patch donations welcome. Open all year. Mike Radford's Hall of Heroes, - FREE - A display honoring men and women of every era. Located inside the Radisson Hotel, lower level, next to the Veterans Cafe' where coffee is always free to veterans. This stirring tribute includes donated military memorabilia, uniforms and thousands of photographs from families across America. An additional Hall of Heroes is locate din the Imax Entertainment Complex. Veterans History Project- Veterans Stories needed - free- The Branson Veterans Task Force Inc, as a partner with the Library of Congress American Folklore Center, is videotaping for future generations, the personal stories of veterans of all branches and all eras. During the Veterans Homecoming, these will be taped between 9:00 am and 5pm . Vietnam Traveling Wall - FREE - The Official, half scaled replica of the Vietnam Veterans Memorial, the most visited memorial in Wash, DC, is open for viewing daily at the Welk Resort Theatre November 5 through the 11th from 8am to 10pm daily. As is customary, the list of names will be read continuously throughout the seven day period. Opening Ceremony is at 10am November 4th. Veterans Rights Seminars - Free – daily workshop sessions regarding veterans rights/benefits will be conducted at Culpepper Place of Branson, 5351 Gretna Rd. Advance reservations required. Call 800-335-8566. Use reservation #211. You will receive a return call to confirm your reservation. 10:00 a.m.(1000 hrs)- Dedication and Memorial Service for the Vietnam Traveling Wall, Welk Resort. 11:30 a.m.(1130hrs) – 1 p.m. Free lunch to veterans and current serving military served at Vendor Village at Celebration City . Live entertainment. Others welcome to dine for a donation. 11:30 a.m. – 1 p.m. (1130 - 1300hrs) Free lunch to veterans and current serving military served at Vendor Village at Celebration City . Live entertainment. Others welcome to dine for a donation. 11:30 a.m. – 1 p.m. (1130-1300hrs) Free lunch to veterans and current serving military served at Vendor Village at Celebration City . Live entertainment. Others welcome to dine for a donation. Noon - Honor and Integrity/ Luncheon honoring youth military groups at the VFW Post 5168 Forsyth , Mo. 7 p.m. - 9 p.m. (1900-2000hrs)- Candlelight Military Memorial Service-all Military and guests invited, Skyline Baptist Church , Hwy. 165 and Fall Creek Rd. 10 a.m. (1000hrs)- KWVA Benefit Show at the Dutton Family Theatre for the Harry S. Truman Chapter of the Korean War Veterans Association. Dutton Theatre is located at 3454 W. Hwy. 76 in Branson. Tickets are $10 for adults. Call for reservations 417-332-2772. 11:30 a.m. - 1 p.m. (1130-1300hrs) Free lunch to veterans and current serving military served at Vendor Village at Celebration City . Live entertainment. Others welcome to dine for a donation. It should be noted that all events, location, & times are at this time subject to change. For further information contact the Branson Veterans Task Force at 417-337-8387 or go to their web site. For information and schedules for shows and attraction or to purchase tickets on line click here or call 800-590-0155. It's happening again, only this time, the Branson boom of the 21st century will bring thousands of new residents. # In the past two weeks, developers have announced projects worth more than $2.7 billion in Taney and Stone counties. # More than 8,000 homes and condominiums are planned or under construction. # The city of Branson expects to break the 1993 record of $119.5 million in new construction with $103.3 million logged through September. In addition to housing, national retailers and new entertainment attractions are in the mix. "I really don't see it slowing down," said Mike Rankin, Branson's economic development director. "I'm getting calls from developers and investors around the country and across the water. And when they think of Branson, they think of a large area from Blue Eye to Kirbyville and the outlying area." Rankin cites several reasons he's even getting calls from investors in Australia, China and Japan who have read about Branson's boom on the Internet. "It's a safe haven in the central U.S. with a perception of family values, our development costs are less here than in other areas," and Branson is an easy drive from many population centers, Rankin says. A site to help customers and Real Estate agents access available housing resources and information. The freshly launched website is located at Branson Real Estate. The real estate market in Branson is booming. The department of econmic development reports record growth as new proposals to build resorts along Bull Shoals continue to come in. This week Branson West will be discussing a 150 million dollar development proposed in the city. The Austrailian courts have ruled against a Richard Branson owned discount airlines failed to give women over the age of 35 a second interview. I really don't see it slowing down soon, as I continue to receive inquiries from developers and businessmen from throughout the country who want to be a part of Branson's tremendous growth momentum." City officials announced this week that they finished the month of September having permitted $103.3 million in new construction for the year, the second highest total in city history, with three months remaining. That puts Branson on track to break its single-year record of $119.5 million in 1993. In fact, September alone saw an estimated value of $27.4 million in new permits, a new record for that month. Much of the boom is directly attributable to Branson Landing, a $420 million retail and convention center development in the city's downtown area along Lake Taneycomo. The project is a joint venture between the city of Branson and HCW Development Company. It is scheduled to open in stages between April 2006 and April 2007. The city reports a 37,000 annual investment in preparing the city for Christmas guests. A display at a cost of 100,000 dollars to the city is in the process of being sold as the traditional spot for the annual Christmas Lights drive through exhibit is in the process of being developed. Rest assured there will be Christmas Lights in Branson with the majority of funds already secured. The city of Branson just announced that the layers of city maps are available for free through the city - the race for a better map is on! Rumour is Kole will be moving to Los Angeles to pursue his career as an artist. 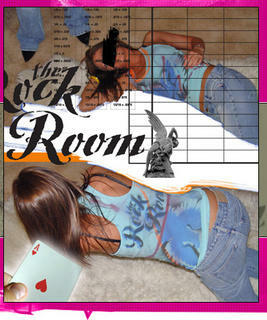 If you want to see current works visit the "Rock Room"